YLAL 10 year anniversary event! - Keynote speech from Baroness Patricia Scotland QC. 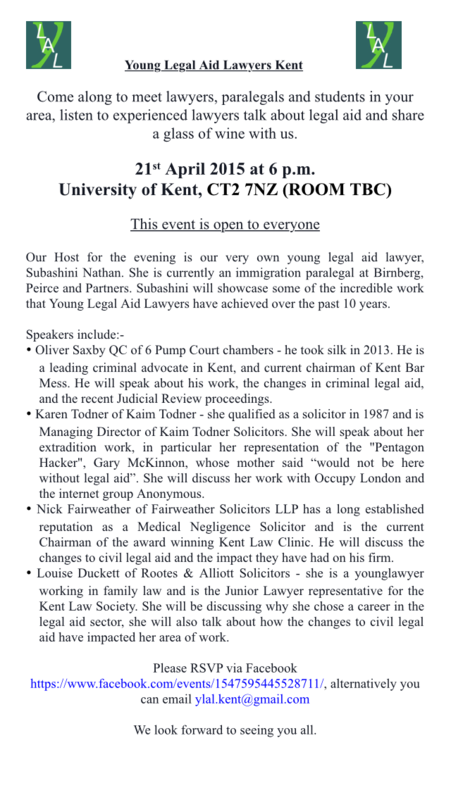 - Panel debate on access to justice after the election compered by Owen Bowcott, legal correspondent for the Guardian. Our speakers are: Andy Slaughter (Labour candidate for Hammersmith and Shadow Justice Minister), Elfyn Llwyd (leader of the Westminster group of Plaid Cymru and representative of the Dwyfor Meirionydd constituency up to these elections), Baroness Jenny Jones (Green Party), Geoffrey Payne (member of the Liberal Democrat National Policy Committee, chair of party policy group on crime & criminal justice and criminal barrister at 25 Bedford Row), James Symes (Conservative parliamentary candidate for Ealing Southall), Solange Valdez (Ealing Law Centre), Martha Spurrier (Doughty Street Chambers) and Connor Johnston (co-chair of YLAL and barrister at Garden Court Chambers). - A drinks and canape reception where you can meet other people passionate about legal aid. The event is being held at Keyworth Lecture Theatre, London South Bank University, 103 Borough Road, London, SE1 0AA. Click here to register to attend. If you would like to ask the panel a question please submit it to ylalinfo@gmail.com at least 24 hours before the event with your name, email address and current occupation. We welcome questions from members who cannot attend the event as well. We would be grateful if you could cancel your booking through Eventbrite as soon as possible so another YLAL can take your place. If you need help email ylalinfo@gmail.com. If you are a YLAL member travelling to the event from outside London and need help with travel expenses because you are on a low income then we would like to make a contribution. Please email us via ylalnorth@gmail.com before the event with your occupation/stage of training, location and likely cost of travel. Can you volunteer to help on the day of the event or during it? We need a hand setting up the event and to help it run smoothly on the night. If you can volunteer please email ylalinfo@gmail.com.